U.S. stocks ended mostly higher Tuesday after wandering between gains and losses throughout the day, as companies reported mixed results for the latest quarter and the Federal Reserve began a two-day policy meeting. The Dow Jones industrial average (^DJI) at first showed a closing reading of 15,525.04, representing a gain of 3.07 points or 0.02 percent, before slipping 1.38 points, or 0.01, to end at 15,520.59. 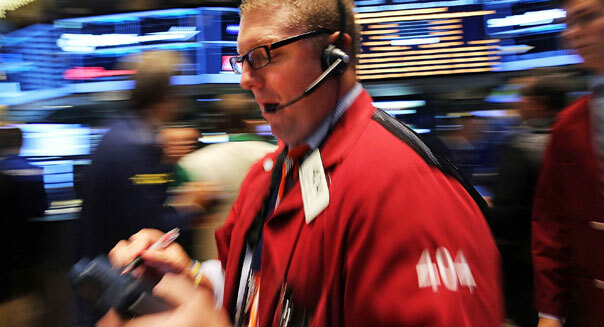 The Standard & Poor's 500 index (^GSPC) tacked on just 0.63 of a point, or 0.4 percent, to finish at 1,685.96. Technology stocks fared better, as the Nasdaq composite index (^IXIC) advanced 17.3 points, or 0.48 percent, to 3,616.47. Shares of Coach (COH) slumped $4.57, or 7.9 percent, to $53.28, after the upscale handbag maker reported a 12 percent drop in fourth-quarter profit as its home market of North America remained weak. Coach also said two more executives were leaving the company. But Goodyear Tire & Rubber (GT) jumped 8.8 percent to $18.54 after reporting its second-quarter earnings more than doubled. Sales in Latin America rose sharply. Beyond earnings, traders were also keeping a close eye on the Federal Reserve. The central bank began a two-day meeting Tuesday and will release an updated policy statement Wednesday. The Mosaic Co. (MOS), a maker of a key ingredient in crop fertilizers, plunged after a Russian fertilizer company said it would drop out of a cartel that kept prices high. Mosaic fell $9.16, or 17.29 percent, to $43.81. Intrepid Potash (IPI) shares also nosedived on the news, dropping 28.52 percent to $13.90, as did shares of Potash Corp. of Saskatchewan (POT), which fell 16.5 percent to $31.65, and Agrium (AGU), which lost 5.4 percent to $86.50. Pfizer (PFE) rose more than 2 percent during morning trading after reporting that its income more than quadrupled, helped by the sale of its animal health business. But those gains were pared following news from the Justice Department later in the day that Pfizer agreed to pay $490.9 million to resolve accusations of illegal marketing of the immunosuppressant Rapamune. Shares ended the day up 21 cents, or 0.7 percent, to $29.75. Rival drugmaker Merck (MRK) reported net earnings that edged past Wall Street expectations, but revenue was slightly less than analysts forecast. Sales of several key drugs fell as Merck too struggles with the expiration of patents. Shares fell 30 cents, or 0.62 percent, to $48.04. Rockwell Automation (ROK) advanced 5.63 percent to $95.65 after the Milwaukee-based company posted a quarterly profit well above analyst forecasts, helped by sales increases in most of its geographic regions. JetBlue Airways (JBLU) shares fell 2.48 percent to $6.49 after the airline reported that second-quarter earnings fell 31 percent, missing Wall Street estimates, as costs rose and its average airfare fell. Masco (MAS) jumped $1.08, or 5.47 percent, to $20.82. The home-furnishings company posted earnings that beat the forecasts of financial analysts as it benefited from a surge in construction. Time Warner Cable (TWC) fell 23 cents, or 0.2 percent, to $115.00. The cable giant is enmeshed in a nasty dispute with CBS (CBS) over programming fees and is threatening to pull the broadcaster, the nation's most popular among viewers of all ages, off its systems. Shares of Nutrisystem (NTRI) rose 8.4 percent to 12.47 after the weight-loss company posted greater second-quarter net income and raised its estimates for the full year. At 8:30 a.m. Eastern time, the Commerce Department releases second-quarter gross domestic product and the Labor Department releases the second-quarter employment cost index. Federal Reserve policymakers issue their latest economic policy statement at 2 p.m., following the conclusion of a two-day meeting on interest rates. PA for a day gives users the opportunity to hire a temporary personal assistant to do office work, run errands, walk pets, or do dozens of other jobs. While the website is great for harried professionals, it may be even better for workers looking to bring home a paycheck on a flexible schedule. If you're looking for a good-paying, short-term job where you can set your own schedule, why not drop them a line? Are you good at putting together IKEA furniture? Do you have time to pick up a Craigslist item? Are you willing to go grocery shopping for someone else? If you answered yes to any of these questions, maybe you should think about joining TaskRabbit, a website where you can submit bids to do odd jobs. Depending on the task -- and on the area where you live -- you can make more than $40 per job. Can you do a good celebrity voice imitation? Are you willing to film yourself wearing a hot dog suit and singing "Happy Birthday"? Are you a good artist? On Fiverr.com, "the world's largest marketplace for small services," you can transform your cool skills into cool cash. Basically, you create a listing with the skill that you are willing to offer, set a price (usually $5 and up), and work on finding clients. At this point, Etsy is hardly a moneymaking secret, but most people don't realize how easy it is to turn the do-it-yourself marketplace into a thriving business. As our earlier article on Fifty Shades of Grey demonstrated, the site makes it easy for an enterprising DIY-er to piggyback onto the latest pop culture trend. If you've ever wanted the joy of hanging out with a dog, but didn't want to sign on for the long-term commitment, you might consider joining Dog Vacay. The website pairs dog owners with dog lovers who are willing to babysit them for a short term. Prices start at $15 per night, but "hosts" can set their own rates. You're also allowed to take care of up to three dogs at a time, which means that -- if you're looking for a way to make some money on the side and don't mind sharing your couch with a furry friend -- this might be a great way to get some extra bucks.